I then read a piece by Elie Godsi on the Quest Baits blog about an electronic option made by Hanhel. It was the Hanhel Giga T Pro 2. Basically it is a two piece unit… a receiver that fits onto the hotshoe of the camera and is plugged into the side of the body. And a remote control that can set the camera to self timer and interval timer. It focuses the camera and can be set up as the angler wishes. It is available for a whole host of cameras (mine is a Canon EOS 30D)… but Nikon’s, Pentax and Olympus are available as are certain Bridge models. It is much quicker to set up than the air release and does not get dragged through the mud as the air cable used to. I fitted my remote with a lanyard so I can keep it around my neck while I’m fishing, ready for a shot and so it won’t get lost or damaged. 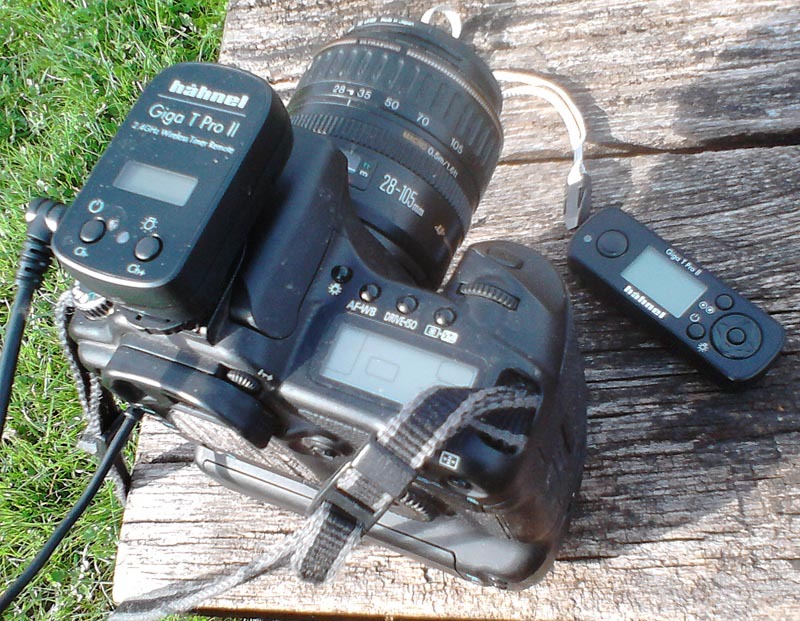 The camera is set on a tripod as with the air release method, and the receiver plugged in. I’ve found at 2m to 2.5m a lens setting of about 60mm or 70mm on the zoom frames me perfectly. If this camera is level at about head height I’m nearly always well framed. If you have a camera with a flip out screen it’s even easier. For my first try out of the Hanhel I simply set it to self timer with a delay of 10 seconds and to take three consecutive photos. This gave me time to press the button, let go of the remote (on it’s lanyard) pick up the fish and to strike a pose. The unit autofocuses between each shot, unless you deactivate the function on the camera itself. 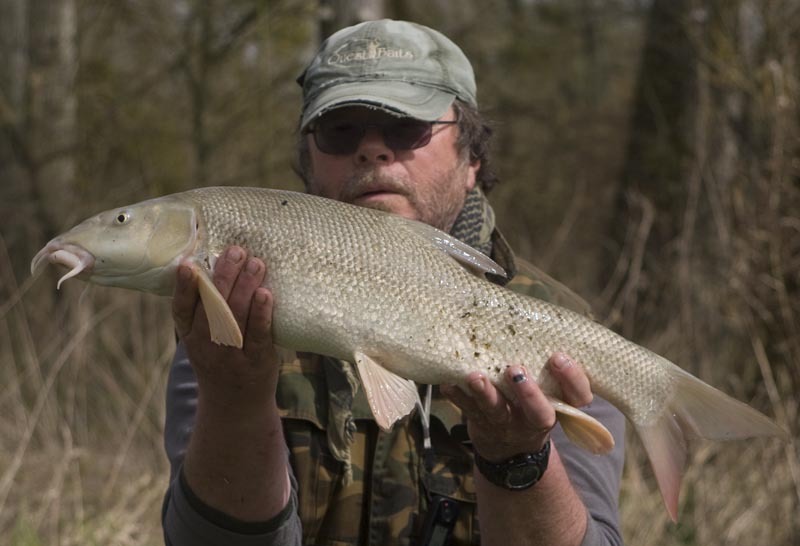 After my first outing I was able to get some excellent shots of a 7lb Aisne barbel. And a 7lb barbel that conveniently allowed me to test out the system. My only gripe with the unit is that as it fits to the hotshoe, you can’t then fit a flash gun for night or low light level shots or use the built in pop up flash either. I’m going to have to find a bracket to mount it to as it is not activated via the hot shoe, but with the supplied cable. The cable also looks to be long enough that I could possibly stick a cold shoe to the top of the flash gun and fit it that way. These can be found in photo accessory shop and usually stick on with simple double sided tape. I think a lanyard should have been included in the box as it costs very little and to my mind is essential on the bank to avoid losing or damaging the remote. My only other concern is for battery life. The receiver comes with a CR2 battery that is easy to change, but the remote has a flat battery and needs a small screw driver to replace it. A no doubt fiddly process that can’t realistically be under taken on the bank. Here is a Youtube video with some info. This entry was posted on Thursday, March 20th, 2014 at 10:16 am and is filed under Tips. You can follow any responses to this entry through the RSS 2.0 feed. You can leave a response, or trackback from your own site.